“Of all the artists who have tried to transform the Broadway musical since Oklahoma!, no one has been more persistent than the composer and lyricist Stephen Sondheim.” (Frank Rich, New York Times). Few of his shows have been hits. Many have been controversial in one way or another. All of them have been interesting. Sure of my lines, no one is there. “Pretty Women” becomes more than just a pretty song when you know that Sweeney Todd is shaving the corrupt Judge Turpin, waiting for the perfect moment to slit his throat. “It's Hot Up Here” is so much funnier when you know the singers are figures in a painting, doomed to spend all eternity in the same pose in the same spot with the same people. “I Remember” becomes much more touching when you know the girl singing it has lived her life in a department store, and can only barely remember the last time she saw the sky. We realized as we rehearsed the show that we would be demanding a lot from our audiences with this material, that they wouldn't be able to just sit back and listen. These songs demand as much from the audience as from the performers. Sondheim proves with every project that the musical theatre doesn't have to be a place where you turn off your brain; it can be a place for high drama, dark comedy, social commentary, and thoughtful looks at the human condition. With this tribute, we present songs that are more truly musical scenes. And so that you can experience the full power of these moments, we present them as they were written to be performed. Stephen Sondheim is a great composer and lyricist, but he is also a great innovator and a great maker of theatre. His work deserves no less. So prepare yourself for a tour of some of the most important work in the musical theatre in the last thirty-five years, from 1957 and West Side Story through 1991 and the controversial Assassins. As Sondheim wrote for Gypsy: Curtain up, light the lights, We've got nothing to hit but the heights. I remember auditioning for New Line’s Tribute to Sondheim back in 1993. I was nervous, and Scott was accompanying me on “Maria” from West Side Story. I can’t remember who else was in there, but I kept thinking to myself, “You’re an actor, not a singer, dummy, what are you doing this fo—” and that was my cue. What did I know? I’d listened to the music and practiced it a hundred times, but I had no idea what they were expecting. I don’t know what I was thinking, but the first million and a half bars of the song were, as I remembered them from recordings, echoey and somewhat off in the distance, like voices floating around. “The most beautiful sound I ever heard…Maria (Maria, Maria, Maria...).” I thought, “Well, that part of the song must come from someone else, so I’ll just breeze past that part in the audition and get to the good stuff.” I mumbled those words, on key, mind you, but I mumbled them nonetheless. I thought Scott would just say OK and jump to the good stuff, but NO, he stayed true to the music, so I mumbled on, until he asked me what I was doing. Uh, singing the song, dummy, I wanted to say. But that would’ve hurt my chances, so I just started singing the lyrics the way they were intended to be sung. I got a part (not that part), and took the graciousness and gentleness of those auditioners with me on the next million and a half auditions, and I remember them all. 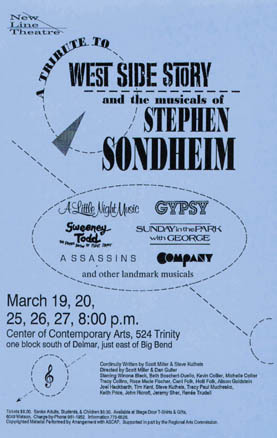 Stephen Sondheim was becoming an important part of New Line Theatre at this time. A few months before this Tribute, we’d held a celebrity auction and received autographed items from Julie Andrews, Jerry Herman, Hal Prince, Gwen Verdon, Elaine Strich, Raul Julia, Jim Lapine, Harnick and Bock, Kander and Ebb, Marvin Hamlisch, and many other Broadway stars. Stephen Sondheim sent us an autographed copy of the private, never released cast album (on LP) of his 1966 television musical Evening Primrose. And I was presumptuous enough, when I wrote to thank him, to also ask him for a cash donation. He sent one. I then thanked him for that and asked if he would be an honorary member of our board. He wrote back and said he would be delighted. Doing this concert of his songs was very special for me because of how incredibly kind he had been to this new, small company way out in St. Louis. And it became a kind of prologue to New Line’s first ten years, as we would go on to produce his shows Assassins (twice), Company, Sweeney Todd, Passion, Into the Woods, Anyone Can Whistle, and another Sondheim concert, Extreme Sondheim. 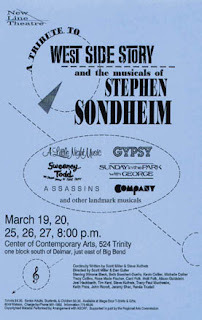 In addition, when we put Out on Broadway together several years later, about a third of the show was Sondheim’s songs. He has had more of an impact on New Line than any other theatre artist, and we couldn’t be prouder to count him among our supporters.